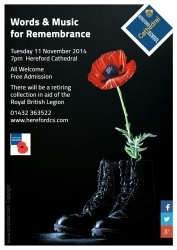 A full Hereford Cathedral heard children from HCS and other local schools sing a number of pieces most wonderfully. Works included extracts from Faure's Requiem, pieces such as "So they gave their bodies" by P Ashton, "We are the young" by Donnelly and Strid and a newly commissioned piece setting a war peom written by D Haseler (OH) to music. In the quite of the cathedral words from the front in letters sent by Tom Wilmot (OH) and Charles LeMesurier (OH) brought the reality of war on land and sea to life in the most moving way. As the final strains of the poignant setting of "For the Fallen" by Guest died away the audience left reflectively through an arch of banners provided by the standard bearers of the Royal British Legion.